In its latest issue, Icon magazine swoons over the new Stata building at MIT, by Frank Gehry, in common with Wired magazine dubbing it the "geek palace". Given the pictures, it's not difficult to see why. The new building certainly looks extraordinary, collapsing in on itself, in folds and twists which defy the eye. However, it may be worth pausing to reflect on the buildings it replaced - Building 20 and Tech Square - which I'll argue were probably more in tune with geekery - and consider whether Stata will really be the improvement that community really needs. Caveat: before going further, please note I'm not writing this as an anti-Gehry screed - the only Gehry building I've witnessed first hand is his Guggenheim Bilbao, which I believe does fit into its local environment, both formally and functionally. As I'm attending DIS 2004 in August, I hope to check this new MIT building out at that point. Not having witnessed Building 20 at first hand either, I'm merely drawing a few words together to raise questions rather than deliver pointed answers. Further complication: Icon suggest that research building is replacing 'Building 20', built in 1943; Wired suggest it is replacing Tech Square, built in 1959. Wired state that Building 20 was demolished in 1998, to make room for Stata. In fact, it's kinda both: Building 20 makes room for Stata; the staff from Tech Square will be the ones moving in. Either way, the characteristics of both Buildling 20 and Tech Square are similar standing in comparison to Stata. "This place is MIT's scuzzy port on the postindustrial motherboard of eastern Cambridge ... nine floors of networking cable and computers piled in sedimentary layers, couches bowed and stained by napping geeks, hallway whiteboards covered in arcana, and vintage machines chugging away in the homegrown programming favorite Lisp ... Tech Square, vintage 1959, was the kind of place only a troglodyte could love. Besides perpetually hissing air vents and windows that didn't open, its cramped floor plan pigeonholed researchers already wary of venturing beyond their own little domains." So much for Tech Square. 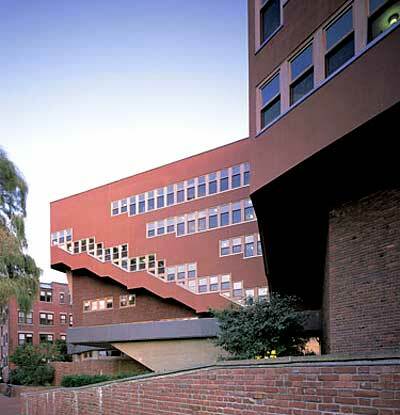 MIT's Building 20 was one of the classic worked examples of 'low road' architecture in Stewart Brand's How Buildings Learn - "the most loved and legendary building of all at MIT" according to Brand. "Unusual flexibility made the building ideal for laboratory and experimental space. Made to support heavy loads and of wood construction, it allowed a use of space which accommodated the enlargement of the working environment either horizontally or vertically. Even the roof was used for short-term structures to house equipment and test instruments. "Although Building 20 was built with the intention to tear it down after the end of World War II, it has remained these thirty-five years providing a special function and acquiring its own history and anecdotes. Not assigned to any one school, department, or center, it seems to always have had space for the beginning project, the graduate student's experiment, the interdisciplinary research center." "Like most Low Road buildings, Building 20 was too hot in summer, too cold in winter, Spartan in its amenities, often dirty, and implacably ugly. Whatever was the attraction? The organizers of the 1978 exhibit queried alumni ... "Windows that open and shut at will of the owner! "; "The ability to personalize your space and shape it to various purposes. It you don't like a wall, just stick your elbow through it. "; "If you want to bore a hole in the floor to get a little extra vertical space, you do it. You don't ask. It's the best experimental building ever built. "; "One never needs to worry about injuring the architectural or artistic value of the environment"; "We feel the space is really ours. We designed it. We run it. The building is full of small microenvironments, each of which is different and each a creative space. Thus the building has a lot of personality." "Temporary buildings are thrown up quickly and roughly to house temporary projects. Those projects move on soon enough, but they are immediately supplanted by other temporary projects - of which, it turns out, there is an endless supply. The projects flourish in low-supervision environment, free of turf battles because the turf isn't worth fighting over. "We did some of our best work in the trailers, didn't we?" I once heard a Nobel-winning physicist remark. 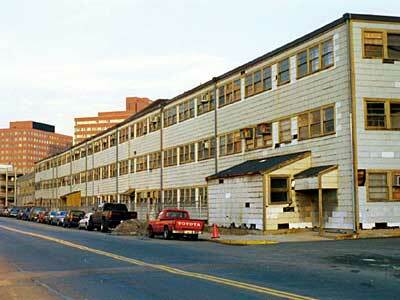 Low Road buildings keep being valuable precisely because they are disposable. "Building 20 raises a question about waht are the real amenities. Smart people gave up good heating and cooling, carpeted hallways, big windows, nice views, state-of-the-art construction, and pleasant interior design for what? For sash windows, interesting neighbours, strong floors, and freedom." Oddly, MIT commissioned Stata to introduce an interdisciplinary way of working to their research, building in zones to increase social contact between researchers, despite Brand's suggestion above that "interesting neighbours" were partly what '20' was about. However, MIT were seemingly aware of some of the characteristics of Building 20 and Tech Square to build into Stata. Wired's article states that the team designing the new building, led by Gehry, attempted to take on these Old Road characteristics in a new building which was anything but. "The new priorities: light, air, and interesting views, along with the mantra adaptability. "We were struggling to break through - they just wanted what they had," Gehry says. "They loved Building 20 because they could beat it up. So I said, 'How about a building where you feel comfortable banging the walls out, putting up stuff?'" Building 20.1! Well, sort of." However, one of the key features much overlooked in Gehry's Guggenheim is that the building's interior features several conventional rectangular gallery spaces, these being most suitable for displaying most of the art to be contained therein. It's just that the exoskeleton is so defiantly non-rectangular, this is either forgotten or sometimes even derided ("Ah look he can't keep up the curves on the inside!"). 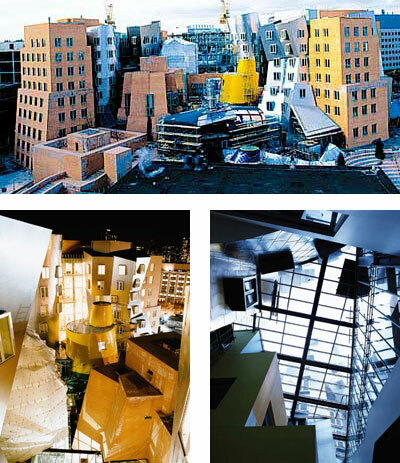 However, to me it's a further example of Gehry's ability to shape a building which is functional. At Stata, there seems to be further evidence of this sensible layering and shaping according to Wired - "The geeks got a high-ceilinged warehouse space on the second and third floors". The service layer also seems sensibly restrained i.e. "no arrays of sensors or touchscreens in the walls, no biometric infrastructure" but there is "ubiquitous wireless and a fiber-optic switching fabric that puts a 10-Gbps network within easy reach of every floor". Compare these ideas and responses to The Smithsons' attempts to build adaptability into Sheffield University in 1953 - a particular facet of architecture for universities is the ebb and flow of academic life, constantly in flux, restructuring and shifting focus every few years. Hence huge adaptability required. Brand again: "Every university has similar stories. Temporary is permanent, and permanent is temporary. Grand, final-solution buildings obsolesce and have to be torn down because they were too overspecified to their original purpose to adapt easily to anything else." Also compare with the textile industry and trade-orientated buildings in industrial and trading cities such as Manchester, Leeds, east London, downtown Manhattan. Their reusability is built on the same principles as Building 20: heavy load-bearing floors (there, built for textile machinery) with hugely reusable space plans inside. First warehouses and textile mills; now lofts and playgrounds for new business. But this point has been well-made before. Brand uses this point about the endless productivity of these old spaces to reinforce one of Jane Jacobs: that new ideas generally can't come from new buildings (The Death and Life of Great American Cities). However, if the Smithsons had attempted to design Sheffield University - a defiantly new building - with the characteristics Brand was looking for in old buildings, perhaps the situation is more subtle than Brand and Jacobs suggest? One hopes so, as much as it makes good sense to reuse suitable old built environment. There are strong ideas in Gehry's building, in terms of creating 'trading zones' forcing disciplines together (more on this theme in a forthcoming entry on Richard MacCormac's new Broadcasting House building) and it's important to resist forgoing innovation and modernity in such buildings in favour of simply lobbing up portakabins for the sake of ongoing adaptability. Adaptability and modernity surely needn't be mutually exclusive. Baker House doesn't seem to have had the same requirements to be multi-functional over time, but it's modern and it works. It'll be interesting to compare these glowing sentiments around a 55-year old building with those around Gehry's Stata in 55 years time, just as Building 20 proved itself over a similar time period.